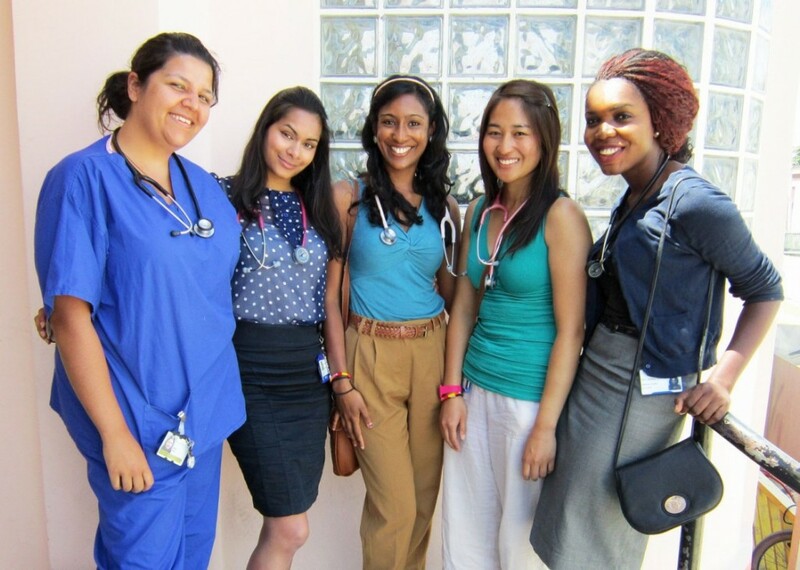 Six medical students are at the Dr. Otto Rodriguez PolyClinic II for a two week elective program. The students came to the clinic through the Medics Away program. Medics Away Ltd. is an international organization that offers highly rewarding overseas experiences for medical students and professionals through electives and activity breaks in a wide range of destinations. Medics Away Ltd was founded in 2003 with the aim to help qualified 3rd, 4th and 5th-year student doctors with the fulfillment of their medical electives. The Medics Away Foundation was set up by Dr. Giles Molyneux to distribute funds to targeted health care projects in hospitals and communities which host Medics Away medical students during their medical electives. Since 2003, Medics Away has organized medical electives and medical internships for hundreds of students in locations around the world. Destinations offered include Bali, Belize, Canada, Egypt, Ethiopia, India, Peru, Tobago and Thailand. The six students at the PolyClinic are from two universities in the United Kingdom. Four of students are from the University of Warwick Medical School in Warwick, England, while two students are from the University of Nottingham Medical School in Nottingham, England. According to Dr. Zuniga of the PolyClinic, "These students basically go to other countries, primarily third world countries to have a different feel for the medical system in each of the countries they travel to. Every year we have a couple students that come in. The students that we have now come from a program called Medics Away, but we usually get contacts from the students themselves. Normally we are contacted by the students and we require them to send us letters that state that they are studying medicine in a particular university, a letter from the university and a CV. We send it to our managers who then approve that they can come to the clinic to do their electives." At the PolyClinic the students get to sit in with the doctors and as part of their stay they get to observe the health system. At the clinic, the students also have a chance to experience emergencies as well as attending to patients in the outpatient setting and in the maternal child health which is pre natal care and the immunization program. Through the Medics Away program, there is a small donation of $50 per week per student that is given to the clinic. Rathiga Rudra, one of the visiting students spoke to The San Pedro Sun of her visit, "We get to submit a report about our elective, describing what we've done, what we've learned and the experience that we've gained. This goes towards our final grade. I have been here going on two weeks. I think it's really interesting because, I think for a third world country, we were quite shocked that it was a free clinic; that it offers free service to the public. The island is absolutely lovely, we really enjoy it. We think that the laid back lifestyle, and the golf carts and the sand and the sea, it's really lovely and everyone is so friendly and welcoming. We've got to see quite a variety of experiences." At the end of the week, when the six students complete their stay, two other students will be taking their place at the PolyClinic.